Chirk Aqueduct stands at 70 feet high and 710 feet long. It is a navigable aqueduct that carries what is now the Llangollen Canal across the Ceiriog Valley near Chirk, on the England-Wales border. The aqueduct was designed by Thomas Telford for the Ellesmere Canal: it was completed in 1801. The water is contained within a cast iron trough, hidden within masonry walls. The aqueduct was completed after Telford's aqueduct at Longdon-on-Tern on the Shrewsbury Canal, and came before the mighty Pontcysyllte Aqueduct on the Llangollen Canal. 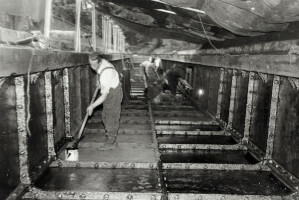 Cast iron troughs were widely used elsewhere on the British canal network, particularly where a secure and watertight crossing or bridge was needed. The aqueduct consists of ten arches, each with a span of 40 feet. The water level is 65 feet above the ground and 70 feet above the River Ceiriog. The first stone was laid on 17 June 1796. The aqueduct's ironwork was provided by William Hazledine. Side plates were added to the aqueduct in 1870. The canal continues in the direction of Llangollen through the Chirk Tunnel which starts at the north end of the aqueduct.